Last month I had the pleasure to visit and meet a very respected blogger and my best friend, Karen Gauthier. She opened her home to me and we had a blast together. I told her about a new fad Pocket Letter Pals and Diana's group on Facebook Pocket Pen Pals. We are both addicted, we made a few together and now we are swapping with others. 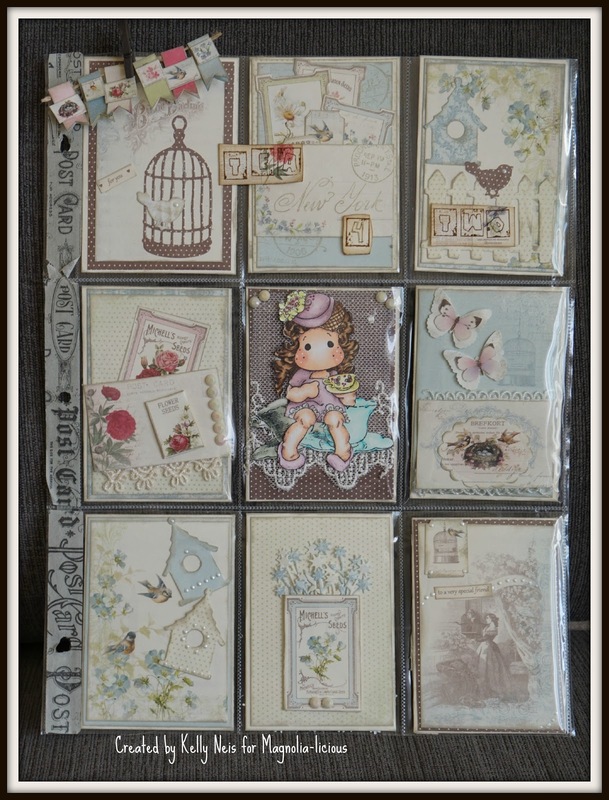 My Pocket letter has Afternoon Tea Tilda with some Tea Cups all from Magnolia's Little London Collection. 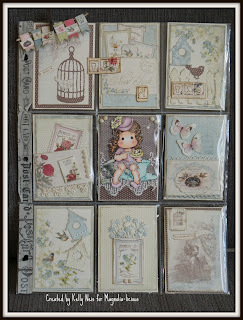 I also chose to use Pion papers in each pocket. The backside is filled with trinkets for the recipient to enjoy. It folds up into a envelope and just mail it off. A few die cuts were added too. My numeral is in the title, Tea 4 two. Today's Magnolia-licious Challenge is use a Numeral. 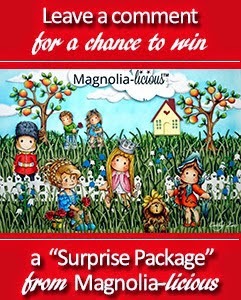 Please join us so you can win a awesome prize from Magnolia-licious! Remember for each comment you leave on a DT gal’s blog (1 comment per blog, per post) you are entered to win the Surprise Prize this week. 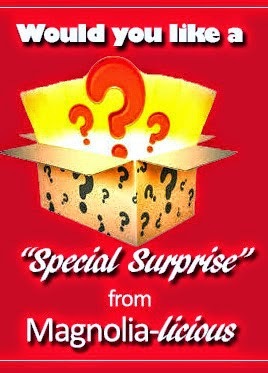 Winners are announced each Wednesday…so check back each week to see if you’ve won! Hope to see you at the challenge and good luck!! I've been seeing a lot of these pocket letters Kelly and I love, love, love yours! Gorgeous pieces and I really like how you have placed the darker, imaged one in the middle and all the rest fan out from it, making it the most definite focal point. Fab colouring and design as usual... glad you are back to some crafting and I hope the house is coming along well. Wow ! this is so beautiful !!!! Superb work my friend ! Oh happy days that you are crafting again. I love your pocket letter. So many yummy goodies that you put together. I have not made one yet. Too busy spring cleaning but I'm almost done. I hope you are enjoying your time shopping for things for your home. I know what ever you get will be gorgeous! Thanks for sharing your talent with us! So happy to hear you are back in your house and having fun picking out goodies for it.